Wow what are you doing to these poor hard disks? On the other end of the probability scale, I have not had a single hard drive fail in 12 years, knock on magnets. (Including my two servers each with 3 hds, my 2 laptops, 4 pcs, 3 macs and one backup drive I’ve had in that time). Xcopy is ok, expecially with your indicated switches, but have you tried robocopy? It comes bundled with the freely downloadable server 2003 resource kit. I’m a huge fan. Can I have your old drives, instead of you smashing them? Try gong to http://www.GRC.com and look for SpinRite. Great product to get your hard drive working again, could take a few days but it does work. Interesting that you noted having a majority of failed Maxtors. Perhaps not surprisingly, that has also been my experience. I’ve been fortunate enough to evade HDD failures for the most part, and the ONLY brand name of hard drive I’ve ever had fail on me was Maxtor (3 hard drives in the last few years). One of these drives hadn’t been backed up in quite some time, and important data had just been added to it. As a tip to fellow readers, there is an application called GetDataBack from Runtime Software that I was able to use to restore the entire contents of that disk. It cost about $79 at the time. I was able to run the software free to verify what could be restored and once I could see it would work, I paid for the license. Maybe give it a shot on some of your drives? Nice tips, and thanks for the suggestions on software. I’ve been using SyncBack free version, but I’m seeking other solutions as well. I like it a lot but UAC in Vista seems to prevent the backup from running on occasion. I’m also only running backups on data and really need to look into a solution for imaging–preferably something versatile, lightweight, and doesn’t require a full-blown installed application. I’ll probably look into BartPE or something as I think that might do what I need it to. I used DriveImage back in the day and loved it because I could re-image my entire PC in less than 5 minutes, and it didn’t require me to have software installed since it was all run from a bootable CD. I did buy Ghost not long ago but it was far too bulky for me. You might want to look into how clean your electricity supply is, as this is supposed to have an impact on hard drive reliability. If you aren’t already running from a UPS or filter, it might be a good time to look into buying one. Encrypt your harddrives. Not at a file or image level. Encrypt the entire drives. Then you can have drives replaced or even stolen without worrying about your data. There’s no good reason not to. That many OSes don’t have good support for encryption out of the box is a true shame. That’s an impressive xcopy command you have there. Have a look at xxcopy, it copies files which are open, much easier as you can just let it go and then carry on with your work. >Can I have your old drives, instead of you smashing them? With all my sensitive data on? No chance. Sorry. I have started using truecrypt to encrypt all the sensitive data on my laptop. I am not sure about the performance penalty for encrypting the entire disk on my development machine – any data? I too have to wonder what you’re doing to the poor things. In the last 17 years I have had 4 bad hard drives, 2 Maxtors (late 90s and they really were junk–but I still will never again buy a Maxtor), 1 Western Digital 120 failed at around 5.5 years old, and one Western Digital 400 arrived from Newegg DOA–it’s replacement is working just fine 18 months later. That’s 4 “bad” drives in 17 years out of maybe 70+ total drives. On my home machines I’ve got 8 250GB in RAID 5 on my server, 5 400GB in my XP development machine, 3 1TB in my desktop machine, 3 74GB Raptors and 2 36GB Raptors as system drives–all Western Digital. 21 drives currently active and no problems in the last 5 years except for the DOA. Hard drives do fail, usually at the worst possible time, but you’re having way too many failures. I’d suggest looking for causes other than the drives themselves. I do have surge protectors in the blocks I plug the PCs into. I am thinking about getting a UPS/filter as well. I see the defective drives in your image are Seagate’s ST3500630AS. These drives have been utter trash for me (check my blog). I bought five in July and have already had *six* replacements. While I wish you the best at recovering your data, I will warn you that it’s going to be a painfully long road until you get something from them that’s trustable. It’s a shame though, I used to consider them the Gold Standard in HD quality. The mighty have certainly fallen. If you have a 5.25″ bay and a SATA port to spare in one of your machines, I suggest getting a trayless SATA rack like the RaidSonic IB-169SK-B that I’m using instead of external USB or Firewire drives. While “raw” disk drives need to be handled more carefully than an enclosed external drive, I still find the handling simpler. Just push the drive in and close the door instead of connecting both a data cable and a power cable. You also avoid the overhead of USB and FW (and possible data corruption which I’ve seen on more than one machine when transferring several hundred GB over USB or FW!). And it scales easily because you can just add more SATA drives. You suggested to back up individual files because “you don’t want to have to restore a whole image to retrieve one critical file”. While backup for a small number of files may be faster that way, you can also restore single files from a disk image very quickly (at least with Acronis True Image). You can even mount the image and just copy out whatever files you need. so far i had only two hdd fail. Plus the inevitable yawn-worthy ‘serves you right for using Windows’ type comments. My own observation is that computers live for 5-6 years on average and hard drives live for about 3 years or so. Maybe its different for newer computers/hard drives, but it used to be that way. Absolutely. I’ve got more than a dozen failed drives floating around my office, all of which failed within the last 4-5 years. But the good news, knock on wood, I haven’t really lost any critical data! Like you say, it really pays to prepare because it’s not a matter of if, it’s a matter of when. And I absolutely agree about mirrored Raid. 100% of my disks are mirrored, on all machines. Even test boxes. The reasoning is that the time it takes to bring back a machine to life from a disk failure is more than the cost of the additional drive required to create the mirrored Raid! Then there’s also that thing with corrupted Windows profiles, where all your settings are lost. It can be fixed somehow and it can’t be compared to hard drive failure, but its still unpleasant. You asked about a full-disk encryption product- After a mandate was handed down by the State, here at UT Health Science in Houston our sysadmins settled on SafeBoot. I do a -lot- of 3D modeling & game developing on this machine, as well as .Net development, and was really concerned about response times. Our grunt systems guy had a tough time getting some of the Gateway laptops running after converting to the product (including mine), but eventually, all 500+ Dell / Gateways made it. After using this for about a year now, I can’t say I notice much of a slowdown, if any, while working, and haven’t had any other problems. I have Zero experience with any other products, but I can say that SafeBoot has worked here. Can anyone recommend a free, and ideally open-source, full hard drive encryption product? Boris, a good-sounding open source encryption utility is FreeOTFE [http://www.freeotfe.org/]. It’s feature list says, “Encrypted volumes may either be file, partition, or even disk based”. – had a deathstar go at 2 years, in the deathstar days (dell replaced). have had 2 to 3 pcs running near 24 hours for last few years. so far no failing noises. – i’ve restored a few things like app settings, otherwise i’ve verified hardly any archive files. – i like the idea of sending to friend (mutual thing), but no one i know bothers backing up. I hadn’t had any issues with hard drives until last year, when I had two failures. I had backups of all the important files due to the constant prodding of my wife, who thankfully never shared my faith in technology. I know extrapolating from my experience isn’t logically defensible, but I have the feeling manufacturers are trading reliability for capacity and speed nowadays. I bet most of your hard drives from the 90’s were retired due to size, not failure. Solid-state drives will become the norm in a few years. They have Moore’s Law on their side. Yes; though none of my hard-drives have died completely yet, I _always_ back up at least all of my code, to a USB flash drive. It takes only a few seconds, and I know that if my HDD were ever to fail and all my code be lost, I would _die_. In my 38 years of working with computers (mainframes to pc) I have seen something I must speak about. I can tell you for a fact that the harddrives built today are being built with a calculated, limited, life span. I noticed this change a few years ago. Before that, harddrive failure was unheard of, it was the last thing one thought about when something went wrong with the pc, they used to last much longer than the rest of the computer. Today I get about 2 years before harddrive failure. Very good article indeed. Maybe I should have listened to somthing like this about a year ago when first one of my raid0 drivesbroke (as in physically one of the sata connectors just came off with part of the hdd) and then my other maxtor had bad sectors all over about 3 month later. I do, however, think that it is very important to appreciate, that most failures are due to the incompetence of the producer. Maxtor as well as seagate seem to make very low quiality hdds compared to hq producers such as Western Digital. I have had 10 maxtors & seagates (a mix of 5:5) and all have failed me with 1 year of buing them. I have currently 12 WDs running of which 1 is 7 years, 2 are 5 years, 6 are 4 years and 5 are 3 years old and they never failed me, i never had even one bad sector and especially regarding the 7 year old one that is an incredible performace realizing that it was overheating on a regular basis (ca 10 times a day) for 2 years until I installed a drive cooler. No wonder 3 of them was Maxtor. Got my self 2 brand new Maxtors that crashed after few days. any of you techies out there(???) Please, just do it(!!!). Perhaps part of the problem is that HDs are so cheap. This must put a lot of pressure on manufacturers to cut corners. Personally I would happily pay double for a HD that was significantly and demonstrably more reliable. I have never used SpinRite but stumbled upon very critical evaluations, sometimes calling it downright useless. You seem to have some experience with it, but “could take a few days” doesn’t sound it would be useful for any emergency. No HDD failures,7 years and running. I’ve had this laptop for almost two years now, and it’s still running nicely. I’ve reformatted it three times now. Going from the start… a 386 for two years, a P2 for six years, and a P4 for three, which went from WinME to WinME to WinXP, reformat in between all… never had a failed hard drive. You must physically abuse them. Out of 20-some computers with HDDs, in the last 5 10 years, all owned by me, I’ve retired all but two of the machines at this point and in all that time I’ve only had two HDD failures. Both were Seagate drives. I don’t know if it’s just bad luck with the Seagates, but I can tell you I’m not exactly rushing out to buy more of them. Doug Rosbury (above) will be getting his wish! Hard Disks will only be with us for a very few more years. Less than 10 more years for sure. Already, solid-state alternatives are available and are much faster and much more reliable. The only problem right now is PRICE. But, the price is already coming down and within 10 years it will be cheaper to have an entirely solid state, non volatile long-term storage device replace all hard drives. At first, we’ll still have seperate fast RAM and slightly slower long-term storage, but as the years continue to fly by, we will see some major changes, petrobyte memories where RAM and longterm storage are one in the same. Excellent post. I recently “inherited” a network which has been running for a good five years only using tape backups (I have created some critical backups elsewhere) I was wondering if anyone has had any experience using online backup sources(Bandwidth is cheap!). Currently I have an offsite 7-day tape system, picked up weekly but was curious if anyone has even thought of moving to 3rd party/researched online backups and cost comparison to hard media. HDs in production use I retire after 4-5 years. Thanks for the stats TrueXRT. Your results for Maxtor, Seagate and WD are the opposite of what I would have expected. I’ve yet to have a failure either … 2 of my boxes are over 6 years old, and one is around 4 now … are you going offroading while transporting your computers? I have had 3 failures, in 10 years. Backup daily, is my mantra. I even have a bright pink sticker taped to my monitor, beside the power button that says BACK UP. How do you know if you really need an image backup? Consider how much you value your data, how much time (and money, if you have to pay someone else to do it) it will take to rebuild a new drive if yours fails and how inconvenienced you will be until your computer is up and running again. With external backup drives becoming increasingly affordable, even home computer users can now enjoy the security that drive to drive backup software can provide. Restoring from an image backup eliminates all the work and time normally associated with rebuilding a new drive. When you restore the image backup to your new drive, not only all of your data files but all of your applications, your preferences, your latest hardware drivers and even your drive partitions are all transferred to your new drive. If you are restoring a boot drive image, the new drive will be bootable as well. The actual time involved in transferring the data to the new drive will depend on the size and speed of the drives. 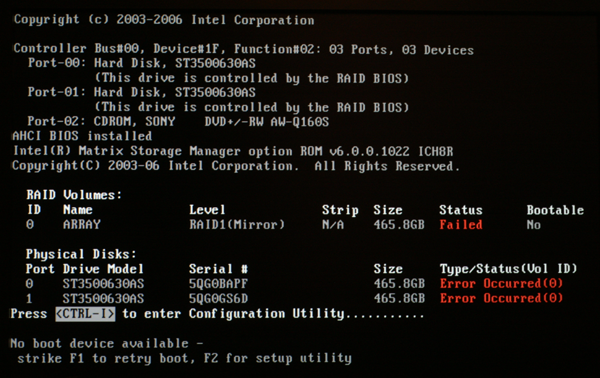 Had one bad harddisk in 15 years, wich was a DOA. About 50 harddisks from all manufacturers, including quite a lot Maxtors, have been working fine untill i replaced them by newer bigger and faster ones. I have two 160 GB PATA Maxtors running 24/7 downloading from P2P and usenet, not one bad sector. None of my internal drives wich run 24/7 did fail. Cheap external drives often have a bad powersupply, bad controller and contain cheap harddisk versions. if you relly want an external one, buy a disk and a separate ecxternal case from a major brand, not the cheap rubbish. I really don`t understand what the hell people do with their harddisks to make them fail. Bad powersupply, trowing them against the wall ? It’s an excellent post! online backup has became one of the most important part to backup your critical business information. Well he has a point the hdd will fail but you can longer the life of your hdd by using different programs and also keep it aware of viruses that might harm your hdd. Also to keep you data safe you should allways use a backup software to keep your important data safe and secured. A good software for that matter is : http://www.dmailer.com/dmailer-backup.html ,is a free software that you can use and also save your data online on their servers.